The Brush > Tablet Pressure sub-palette controls how ZBrush uses input from a graphics tablet. 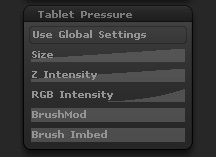 The Use Global Settings lets you define the same tablet pressure settings for all your brushes, based on the setting set in the Preferences >Tablet sub-palette. The Brush Size curve will control the size of your brush based on the pressure of your pen on the tablet. From left to right the the curve will be representing light to hard pressure. The Z Intensity curve will control the Z Intensity of your brush based on the pressure of your pen on the tablet. From left to right the the curve will be representing light to hard pressure. The RGB Intensity curve will control the RGB Intensity of your brush based on the pressure of your pen on the tablet. From left to right the the curve will be representing light to hard pressure. The Brush Mod curve will control the Brush Mod of your brush based on the pressure of your pen on the tablet. From left to right the the curve will be representing light to hard pressure. The Brush Imbed curve will control the Brush Imbed of your brush based on the pressure of your pen on the tablet. From left to right the the curve will be representing light to hard pressure.